There's a lot that goes into the operation of a drawbridge no matter where you are! Wonder how a drawbridge operates? You probably wonder how these bridge tenders operate their drawbridges when a boat has to pass through. I have created a fact sheet on the sequence of operation when a drawbridge has to be opened for you to read. The fact sheet is in Adobe PDF format; you will need the Adobe Reader to view the fact sheet. Here's a video created by Marshall Brain of How Stuff Works that shows how a drawbridge works, which you can find in the videos section of DrawBridgeAhead.com. I put together a list of the drawbridges of Pinellas County in a concise one page sheet listing the name and location of the drawbridge, the owner, and its opening schedule. The list is in Adobe PDF format and you will need the Adobe Reader to view the list. This list is convenient to carry aboard your boat (or keep in your car) for easy reference! Special care should be taken when you approach a drawbridge in the same manner as when you approach a railroad crossing. Here's another PDF document on safety around a drawbridge whether you are boating under or driving/walking over a drawbridge. It's recommended reading for everyone! Drawbridges cost more to design and build than fixed bridges. This is due to several factors including the steel that has to be ordered from steel factories outside Florida. Speaking of steel, it has to be coated to protect the steel movable structure from the aggressive saltwater environment of Florida's waterways. More and more newer drawbridges in Florida - mostly replacements such as John's Pass and Treasure Island Causeway - today feature an all concrete deck ride as the center section consists of a special deck called an exothermic deck which allows the center section to be filled with concrete. The end result is that the motorist does not have to listen to the drone of a steel grid deck which is the case with most of Florida's older drawbridges. Most drawbridges are staffed 24/7/365 for major waterways such as the Intracoastal Waterway. However, drawbridges that span minor waterways are either staffed part time on a fixed schedule or the bridge tender is on call, usually to help hold down costs of operation. 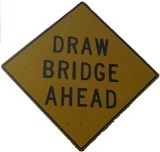 Most bridge tenders work for private entities, who contract with the owner of the drawbridge in question (such as the Florida DOT) to operate the bridge in accordance with regulations set by the United States Coast Guard as well as the rules and regulations of the particular drawbridge owner. Copyright © 2007-2016 Edward Ringwald. All Rights Reserved.